Our Heartfelt Felt Mattress Protectors are unique and half the thickness and weight of the Heartfelt Medicinal Wool Felts. Made of 100% wool, these wool mattress protectors are available in several different sizes and perfect for putting on top of your wool mattress or as a protective layer over your thicker bed felts. Our light wool felts are New Zealand “World Class”, ecologically produced wool. Our felts usually ship out within a few weeks. Experience the direct benefits of wool with our Heartfelt Felt Mattress Protector. A wool felt mattress protector works great as a top layer on a your bed since they are hand washable. These felts are half the thickness and weight of the Heartfelt Wool Medicine Felts and are intended to be used as a protection/maintenance layer over your mattress or thicker bed felts. This thinner wool felt is the perfect addition to every bed. Keep in mind that each Heartfelt Felt Mattress Protector is a piece of art and may vary within a few inches from the advertised size. 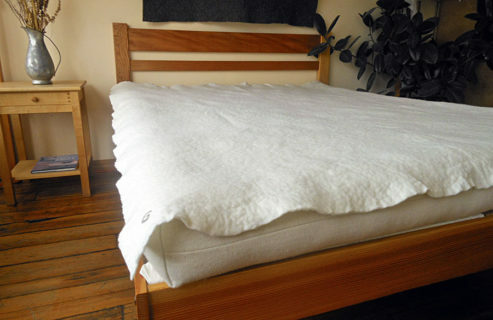 Our natural/ivory colored wool felt mattress pads are 100% “World Class” wool from New Zealand. The colorful Heartfelt logo is placed in the corner of each felt pad. Each felt pad is created by pouring hot soapy water on batting and then stomping on the wool. This process causes the fluffy wool batting to shrink into a dense solid pad. We complete the process by washing the felt mattress protector in a washing machine. 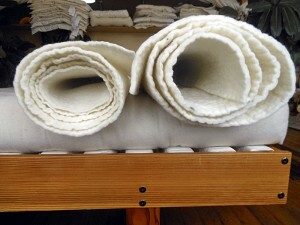 The result is a beautiful, hand washable wool felt mattress protector! In Mongolia, wool is felted and used as the walls for their yurts, hammocks and clothing. Today, wool is felted into slippers, purses, hats, jackets, shoes, dolls and more! We sell our wool batting if you would like to explore with felting wool. 31 x 52 x .25 Approx. 31 x 80 x .25 Approx. 41 x 78 x .25 Approx. 62 x 80 x .25 Approx. 82 x 80 x .25 Approx.